Blesserk, or Berk as was his name before this all took place, was a normal yellow little Shoyru. He grew up where most Shoyrus grow up, in Neopia Central. He went to school, liked to explore, and practice cool flight tricks. He was though, in one way, very different from his schoolmates. He loved faeries. 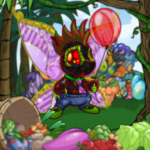 All Neopians love faeries. They're what make this world the amazing place that it is. Some Neopians even think that without faeries, Neopians themselves would be mindless, wandering beasts, just as mean as the Snowager and twice as stupid. Berk was not like other Neopians in the way he loved faeries. He was obsessed. He idolized them. He hoarded all faerie themed items. Every notebook, pen, or bag that was released into the School Supplies shop he had. He read every book, cut out every Neopian Times article, and vexed anyone who would listen with his constant ramblings and unending questions. 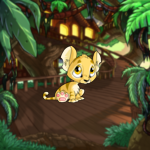 He might have grown out of his obsession like most young neopets do. He might've, if not for the most glorious moment of his young life. To most Neopians, it would have just been another normal random event. To some it would have been considered an inconvenience. To him, it was a miracle. He had heard stories of the faeries leaving their home to ask Neopians for certain items, but he had never actually met anyone who had this happen to him. Although, to be fair, if he HAD known anyone who had gone through such a thing they would never tell him as it would mean hours of explaining over and over what had transpired. This particular air faerie would have had no idea what her simple request would create in the small Shoyru. She flew up to him as he explored outside of Neopia Central and asked him kindly for a container of Dark Eyelash Face paint. His eyes were wide and he nodded slowly, awe on every facet of his face as he accepted her request. After she left, instructing him to bring her item to him in Faerieland, he sped off as fast as his small wings could carry him to the Marketplace. In the middle of the Marketplace stood a large tall tent that strongly resembled a crooked wizard's hat. This was with good reason, as inside lived the wise Shop Wizard, able to tell you exactly where to buy an item and find you the best deals in town. Berk flew into the tent in such a rush he almost tore down the door flaps, managing to get his wings stuck in them instead. He hoped on one foot as he untangled himself. Out of breath he shouted his request at the top of his lungs, with quick glances over his shoulder. Once he was free he attempted to regain his balance and run to the Wizard. Half running, half hoping, he made his way to the mysterious yellow JubJub and repeated the item more calmly, the note of panic still present in his voice. The Wizard smiled at him mischievously and shook his head (well, more realistically, angled his entire frame this way, then that, as JubJub' heads are their bodies, and their bodies their heads). "I can't help you, young Shoyru," the Wizard said. Berk froze, mouth gaping at the Wizard whom he had always found incredibly reliable. "But... Why? Why won't you help me?" Berk was shouting again. "This is important! This is urgent! This is—"
He was cut off. "This is a faerie quest. I am not allowed to assist Neopians with faerie quests. You will have to think about where you can find such an item, and find it without my aid." Berk opened his mouth, closed it, and opened it again, his mind blank. If the Shop Wizard couldn't help him, then how would he find the face paint that this graceful faerie needed so desperately? Where could he buy cosmetics and grooming products? His face lit up with fresh inspiration and he took off again, without as much as a goodbye to the Wizard. He unceremoniously knocked a couple of Usuls off their feet as he bolted into the Grooming Parlour. He hit his fist on the counter, took a few gasping breaths, and shouted (gasping between each word) for the item to the red Usul shopkeeper. He emptied his pockets of every neopoint he had on him; which, admittedly, was not a lot. The shopkeep frowned at him, not very happy with him knocking over her customers. She looked under the counter for a few moments before pulling out the item he wanted, placing it carefully on the counter. She then counted his neopoints slowly and carefully, maddeningly slowly. She finally nodded and pushed the circular container toward him, clearing the counter of his payment as he bolted out of the store. Berk had never been to Faerieland, having been told that he was too young to make the journey alone. When he got there, he was astounded. Faeries! Faeries everywhere! He shook with excitement and nerves as he wandered the city. It was amazing that he didn't just fall right out of the sky with how bad his jitters were. As he turned a corner, he finally found them. There, at the end of the road, was a group of faeries rebuilding a section of Faerie land. There, off to the side, was the air faerie that had requested the item. She was speaking with another few faeries, all of them hunched over a table with blue prints. His breath quickened and he flew forward, trying to look as brave and valiant as he could muster while trembling so terribly. He said nothing, just held out the item once he approached them and waited. A dark faerie that was working with this particular air faerie saw him first and smirked. She tapped the air faerie on the shoulder and nodded toward the quaking Shoyru and laughed mockingly. Berk stood up straighter, but shook harder with his nerves. The air faerie looked first at the dark faerie on her left, then turned and saw Berk holding out the circular container of face paint. She smiled kindly and took the item from his outstretched paw, which quickly retracted. She spoke softly to him, her voice like a gentle breeze, and praised him for finding her item. Then... she blessed him. He had not expected a blessing. He had rushed out, spent every neopoint he had, moved as fast as his little body could go, just for the joy of serving one of the awe inspiring beings. For her to give anything back to him was unnecessary, but she did anyway. She put her hand over his head and blessed him with an extra bit of speed. Once the soft blue light faded she gave him another smile before turning back to her blueprints. Berk watched her for another moment, slowly backing away. He knew it was his time to leave, but as he flew slowly up the street he glanced back at the group of faeries and whispered softly, "When I grow up, I'll be a faerie, too." When he got home he set to work. Berk fashioned a pair of faerie like wings that could fit over his own without impeding his ability to fly. He dressed himself as wonderfully as he could, complete with face paint. It took him a few days to accomplish his goal, but he did, and here he was. He was no longer Berk, but Blesserk! The most blessing-est faerie in all of Neopia! He spent his days soaring around the different continents, "blessing" Neopians with Bottles of Sand or Rotten Sandals that he had imbued with "magical properties." Most Neopians didn't know what to make of him, and nobody could tell the difference between these items and regular junk. Some thought he was just a kid playing around. Some thought he was crazy. Others laughed at him, but that was okay. Not every neopet was cut out for the Faerie life. Not all Neopians knew that without faeries, their world would crumble. Awnix Meets the Fire Faerie!